Henschel Corporation of Ames- bury, Mass., a unit of General Sig- nal, has announced the appoint- ment of George U. Curry as president. He succeeds George E.
Marine Transportation Committee of the IEEE. Henschel Corporation is a leader in the design, development, and manufacture of ship control and interior communications equip- ment and systems. IMO Pump Division of Trans- america Delaval Inc., has just pub- lished a new 14-page illustrated brochure on their line of IMO® three-screw and GTS® geared, twin- screw marine cargo pumps. IMO three-screw pumps are in- tended for dedicated barges and tankers. They can handle cargoes from JP-5 and light diesel oil to molasses, tars, and heavy as- phalts, with flows up to 3,500 gpm (5,000 bbl/hr). GTS (Geared Twin Screw) pumps are designed for multi-cargo ves- sels where maximum cargo versa- tility is required and tanks are frequently Butterworthed. Car- goes can range from water solu- tions and other chemicals with the lightest viscosity to heavy as- phalts and tars. Capacities range upwards to 8,500 gpm (12,000 bbl/ hr). Washington, D.C., is the contract- ing activity. Krupp MaK Diesel Inc. in Glen- view, 111., near Chicago. Canada, mainly on the East Coast; in 1983 alone 24 engines were de- livered to that area. In addition to the service center in Halifax, MaK will establish a sales office in Montreal. 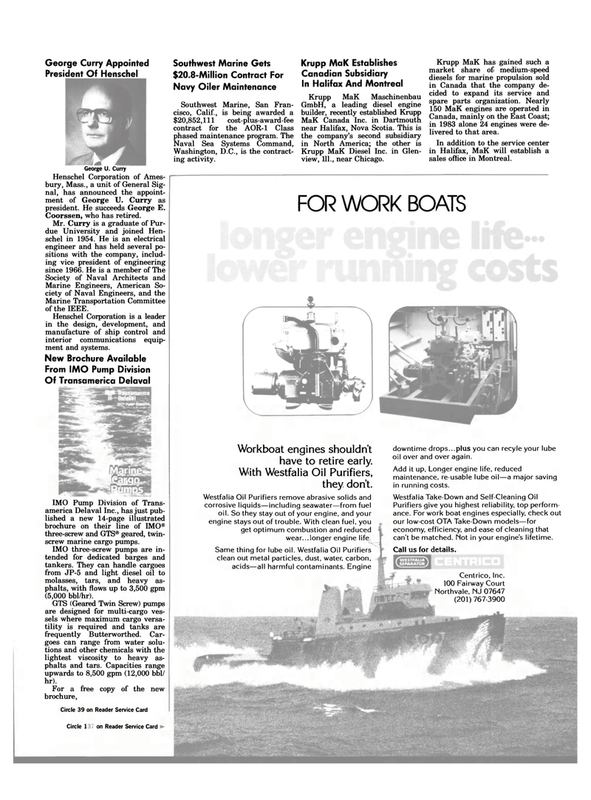 Workboat engines shouldn't have to retire early. With Westfalia Oil Purifiers, they don't. Same thing for lube oil. Westfalia Oil Purifiers clean out metal particles, dust, water, carbon, acids—all harmful contaminants. Engine downtime drops...plus you can recyle your lube oil over and over again. Add it up, Longer engine life, reduced maintenance, re-usable lube oil—a major saving in running costs. Purifiers give you highest reliability, top perform- ance. For work boat engines especially, check out our low-cost OTA Take-Down models—for economy, efficiency, and ease of cleaning that can't be matched. Not in your engine's lifetime.